A couple of weeks ago, BeeBop and I headed out on a Saturday afternoon to the north Georgia mountains. We were bound for Brasstown Bald, the highest point in Georgia at an elevation of 4,783 feet. It’s a lovely spot far up in the mountains with about 13,000 acres of wilderness area surrounding it. We’ve been to the top of the observation tower there several times. You can actually see four states from there and, on a clear day, they say that some of the taller buildings in Atlanta (more than 100 miles away) are visible. In the summer there’s green as far as the eye can see and in the fall the entire area glows with reds, yellows, and golds. It is indeed a beautiful spot to visit. However, this time we wanted to be there in the total darkness. See, Brasstown Bald is in one of the few “dark sky” spots in north Georgia. They even turn off all the parking lot and building lights at night. And it was the dark of the moon in late July. Have you guessed what we were up to yet? No? Why, stargazing, of course! If you’ve never seen the night sky away from the light pollution present in most areas, you should definitely put it on your bucket list. You won’t believe how many stars you can see! And summer is the best time to view the Milky Way. You do have to be patient, though. You must wait until the sun’s light has completely disappeared and your eyes have totally adjusted to the darkness. All that takes a lot longer than you might think. But it’s so worth it. There’s nothing quite like standing under a clear, dark sky looking into the center of the universe. 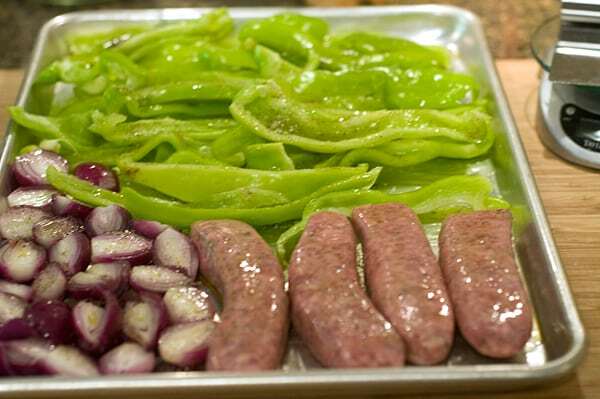 So what does stargazing have to do with a recipe for Italian Sausage with Roasted Peppers and Onions? Not one single thing. Except that on the way to Brasstown Bald, we stopped by Osage Farmer’s Market. It’s one of the best produce stands in the area and I found so much to bring home! I bought lady peas, butter beans, tomatoes, okra, and cucumbers, along with some gorgeous Cubanelle peppers and tiny little red onions. The peppers and onions wound up in this recipe and they were delicious. It’s amazing what a difference fresh from the farm produce makes in your recipes. Get started by preheating your oven to 425 degrees. You probably won’t have these tiny red onions, so you can simply use one or two of the large kind which you’ll peel and slice lengthwise into wedges. If you’re lucky enough to have the small ones, bring 3 cups water to a boil. Add the onions and boil for one minute. Drain. Remove roots and outer skin. Cut small onions in half. Remove stems and ribs from the peppers. Slice lengthwise into strips. Place the onions and peppers on a large baking sheet. Drizzle with olive oil and sprinkle with salt and pepper. Add the sausage to the pan. Roast for 25-35 minutes or until vegetables are soft and sausages are cooked through. While the vegetables and sausages are cooking, prepare some linguine according to package directions. Drain the pasta and return it to the pan. 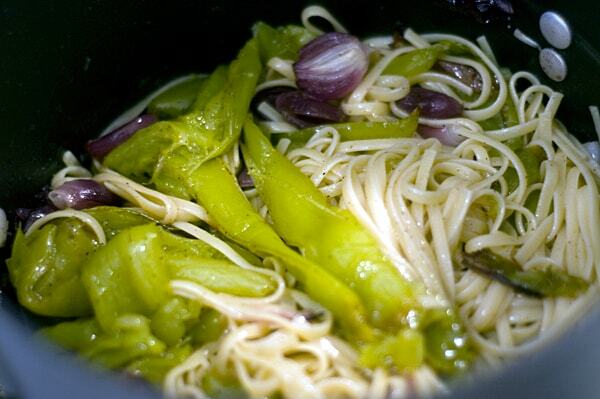 Add the roasted peppers and onions to linguine and drizzle with remaining olive oil. Toss pasta and vegetables. Serve with sausages. Add more salt and pepper to taste. 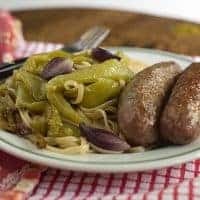 Italian Sausage with Roasted Peppers and Onions. 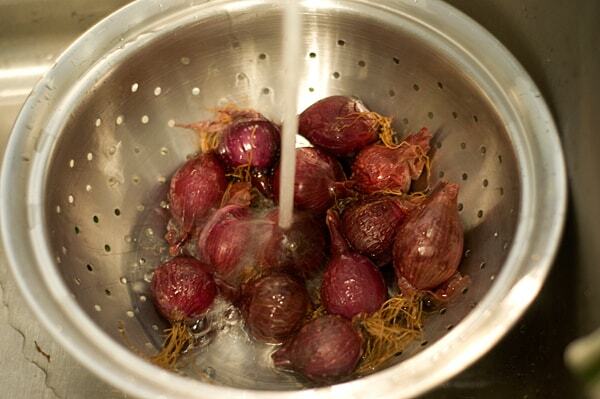 Peel and slice the large onions, or if using small ones, bring 3 cups water to a boil. Add the onions and boil for one minute. Drain. Remove roots and outer skin. Cut small onions in half. 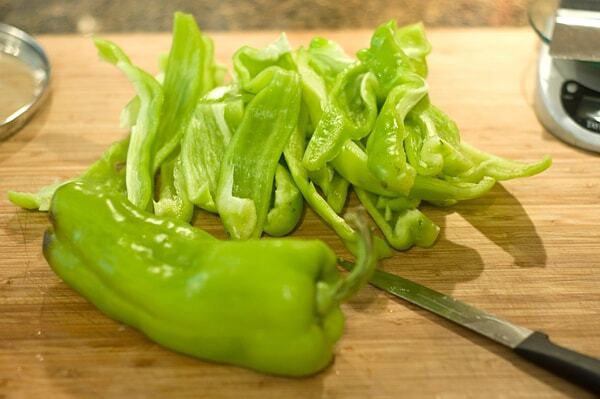 Remove stems and ribs from peppers. Slice lengthwise into strips. 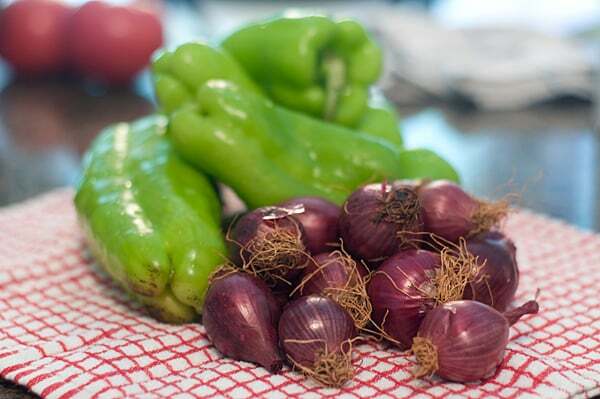 Place onions and peppers on a large baking sheet. Drizzle with olive oil and sprinkle with salt and pepper. Roast for 25-35 minutes or until vegetables are soft and sausages are cooked through. While vegetables and sausages are cooking, cook the linguine according to package directions. Drain pasta and return to the pan. Add roasted peppers and onions to linguine. Drizzle with remaining olive oil. Toss pasta and vegetables. 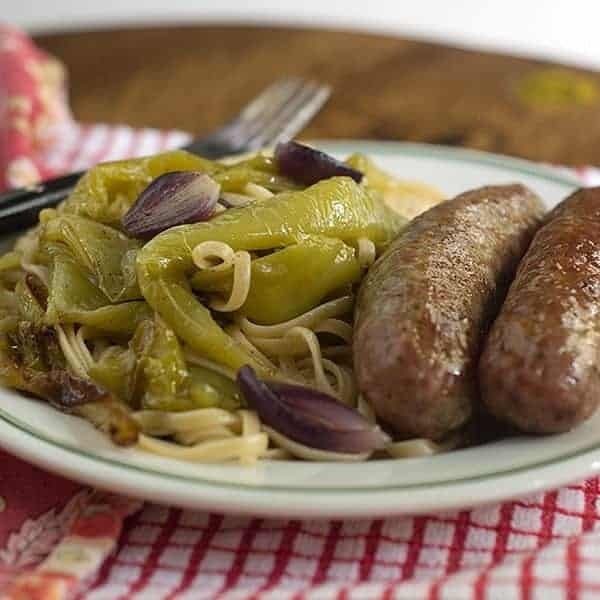 Serve pasta and vegetables with sausages. Come to my house. You can star gaze from the pasture, 10 steps from the back porch. We’ve done it before, laying on those old fashioned beach lounge chairs that fold up into thirds. If you happen to see a shooting star, it’s a breath taking sight. Peppers/Onions/Sausage looks great. But not as good as a shooting star. I just discovered your website and it’s WONDERFUL!!! But, I have no luck to really explore it by having it honor requests for special recipes. How do I do that? Any help will be greatly appreciated. Thanks! There is a “search this website” bar in the right most column. You can search for specific recipes there.